We know that firms using marketing analytics and market dashboards outperform their competitors. Even a small improvement in using analytical dashboards brings on 8% higher Return on Assets on average, and 21% for firms operating in highly competitive industries. However, only 16% of large international companies use marketing analytics and this number even lower for small and medium-sized firms (SMOs) and for emerging markets in prof. Pauwels’s experience across America, Europe and Asia. Here is your opportunity to stand out from your competitors. 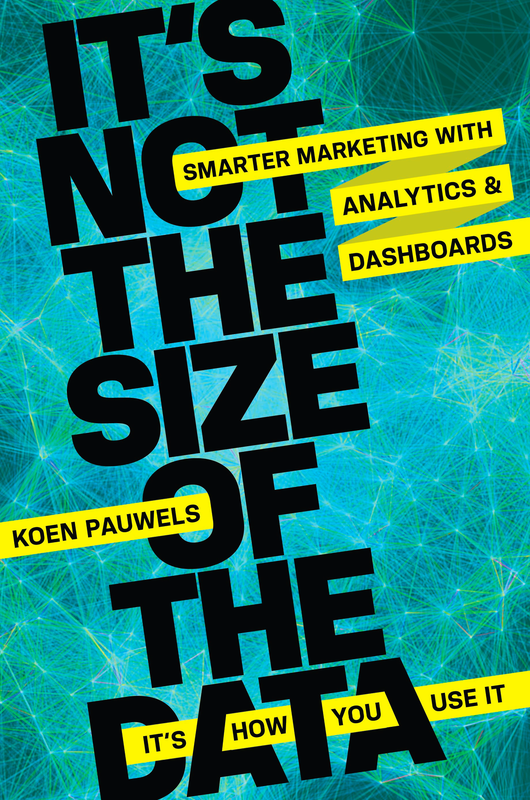 His new book “It’s not the Size of the Data, It’s How You Use It: Smarter Marketing with Analytics and Dashboards” invites you in 4 steps to (1) understand what market analytic dashboards can do for you, (2) plan the market analytic dashboard, (3) develop the dashboard, and (4) act on dashboard insights to improve decisions and performance. Hi, your link “Dashboards in Action” is broken. And on your book page (notsizedata.com) the Google slides are not there.